We strive to provide pasture-raised beef & chicken eggs to the local community and to be transparent in our practices while taking care of the land and our animals. Our goal is to ensure we are making the world a better, cleaner place to live every day. We are Clifford & Gina Walker and the farm was established in 2007 with only cattle as Clifford built fences, corrals, barns, etc. In 2009, we got married and moved to the farm to live full time. We both worked off-site full time, so it was a weekend project farm. In the course of living on the farm and learning how to be more self-sustainable, we started raising chickens and learned how enjoyable it was to know exactly what was going into our food. We noticed our health was improving and we just felt better. Our friends in town started wanting 'clean' food from the farm. They wanted to know how and where their food was raised. 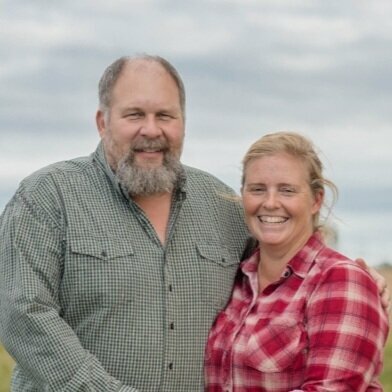 As our herd of cows and flock of chickens expanded, it became apparent we needed to do this full time, so Gina quit teaching high school in 2016 in order to become a full-time FarmHer. This opportunity has allowed us to connect more with our community and focus on healing the land and ourselves with wholesome, nutritious food. Our dogs, Toby, Hazel, & Blue, provide daily entertainment defending our yard from all aerial predators, both foreign & domestic. The highlight of their day is when our resident fence jumping cow (Crack Mama) decides to saunter across the yard. Follow along with their adventures on either Instagram or Facebook! ALONG WITH FARM UPDATES, TUTORIALS, RECIPES, COOKING TIPS, AND MORE! Thank you! Please check your email for your free guide.